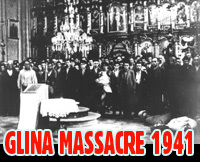 The massacre in Glina Orthodox Church took place on 29th July 1941 in Glina, Banija region (Croatia) where 1,764 people of Serbian nationality were killed. The perpetrators were Croatian Ustasha, and victims were local civillians of Serb population from the village of Glina and the surrounding area. Men from the village of Glina were mostly killed earlier in the slaughter on May 11-12, 1941 at Canal and Hadjer. At the end of July 1941 the members of Ustaha units entered a village near Glina and Vrginmost (Kordun region), captured Serbs, some of them by fraud promising them they would be "baptized", taking with them children and elderly men, brought them to Glina and closed them in the Orthodox Church. On the eve of Ilindan (the day when Serbian Orthodox Church celebrates Elijah, the prophet) 1.941 victims were slaughtered. 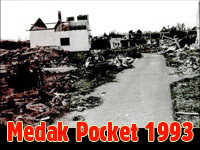 The only survivor was Ljuban Jednak. Ten years after the crime, the communist authorities raised a common ossuary memorial for all victims. On July 4, 1969 the people of Bania on raised the Memorial House of Victims of Fascism in Glina with their own contributions. After the genodical operation "Storm" from 1995, the Croatian authorities renamed the Memorial Home of the Victims of Fascism in Glina into the Croatian National Home. Belgrade demonstrations on March 27, 1941. Kingdom of Serbs, Croats and Slovenians, the first South Slavic state, later renamed into the Kingdom of Yugoslavia, was created after the First World War, with its promulgation on December 1, 1918 in Belgrade. The Yugoslav Kingdom was teritorritaly divided into banates in 1929 and the structure of its government was parliamentary monarchy. The royal title was held by Serbian Karadjordjevic dynasty. It consisted of Southern Serbia, Shumadija, Raska, Kosovo and Metohija, Eastern Serbia, Montenegro, Bosnia and Herzegovina, Vojvodina, Slavonia, a small part of Dalmatia, Dubrovnik Republic, Lika, Kordun, Banija, Zagorje, Gorski Kotar and Slovenia. After the assassination of King Alexander I Karadjordjevic in Marseilles on October 9, 1934 the country was ruled by regents: Prince Paul Karadjordjevic, Dr. Radenko Stankovic and Dr. Ivo Perovic, and the government was formed by Dragisa Cvetkovic and Vlatko Macek. In mid-1930 Europe witnessed rise of Nazism and Fascism, especially in Germany, Italy and Spain. This led to formation of the Tripartite Pact, on September 27, 1940 between Germany, Italy and Japan. In the coming months, this alliance was joined by the following countries: Hungary, Bulgaria, Romania, Albania etc. Thus, the Kingdom of Yugoslavia found itself surrounded by Axis Powers. In Vienna, on March 25, 1941 the signing of the protocol between the Kingdom of Yugoslavia and Nazi Germany took place regarding the passage of German and Italian troops through Yugoslav territory. Among the patriotic forces of the Kingdom of Yugoslavia this was interpreted as a treason, and the British and Soviet intelligence officers organized a military coup and demonstrations on March 27, 1941 in Belgrade resulting in the overthrow of the governorship led by Prince Paul and putting on the throne a minor king Petar II Karadjordjevic. Hitler changed the plans and the armed forces planned to attack Greece, were diverted to the Kingdom of Yugoslavia. 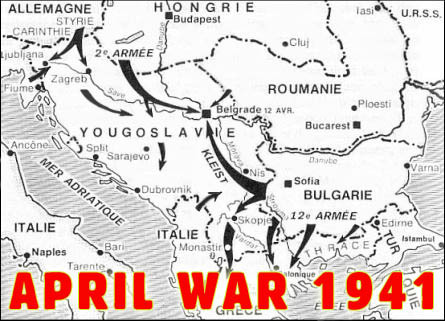 On April 6, 1941, Nazy Germany and Fasist Italy, together with its allies (Hungary, Bulgaria, Romania and Albania) attacked the Kingdom of Yugoslavia, which capitulated after only a few days. The Kingdom of Yugoslavia was dismembered, and most of its territory belonged to the Independent State of Croatia, which was promulgated on April 10, 1941 in Zagreb. Ante Pavelic (notorious Ustasha commander) was elected as its leader. Immediately after the formation of the Independent State of Croatia, conduction of genocide against Serbs, Jews and Roma began. Also, the SPC was banned and had its property confiscated, with the SPC clergy persecuted and killed and churches burned and demolished. Serbian Cyrillic was also prohibited on the territory of ISC. It was estimated that the percentage of Orthodox Serbs in ISC was higher than 37%, which was not acceptable to the Ustasha government and Vatican which provided great support to the new Ustasha authorities in Zagreb. Ustasha ideology was reflected in that genocide and extermination of Serbs, which was publicly uttered by Mile Budak, Ustasha minister, in Gospic on May 2, 1941. Glina is the town in Bania region and for centuries it was located on the border of Ottoman Empire and Vojna Krajina (Military Border Region). It lies on the river Glina and the Zrinska Mountain is in its vicinity. First communities in this area are traced back to 13th century. This area had been desolate before Serbs who were fleeing from Turkish terror and tiranny started to inhabit it, receiving privileges from the Austrian tzar in return for their military service on behalf of the Habsburg Monarchy. For centuries, Glina had been populated mostly by Serbs. As early as 1777, Glina had its orthodox church city hall, and much earlier it got first school in Serbian language which was later closed in XIX century. During the First World War a great number of men from Bania and Gnjilane region were recruited as Austrian soldiers and sent to front. At the front, most of them surrended to Serbs in Serbia and kept fighting against the Austrian Army. After liberation at the end of 1918 and with creation of the first Yoguslavian state- the Kingdom of Serbs, Croatians and Slovenians, Glina town and Bania region administratively became part of the Savska Bannate. In the villages around Vrginmost, Ustasha told people that those who responded to the call for Catholic baptism would be spared, and that all rebels would be killed. Although a lot of people doubted this statement, yet about 1,200 people from the village of Donja Blatuša, Čemernica, Donja Pjescenica, Kozarac, Crevarska Strana and Brnjavac gathered and 40 Ustasha members took them by truck to Glina and closed them in the Orthodox Church where they were later slaughtered. After that, the Ustasha continued their actions especially around the village Bovic. Some arrested people were not killed in the church, but in the marshy fields next to Glina' Novo Selo. The third group of farmers from the village Dragotina and Klasnić, who were in the Glina prison, were taken by train to Lika and slaughtered there. - "Pero Miljevic, an innkeeper from Topusko, was also captured in the Church. Ustashe asked him, "Hey you, Pero Miljevic, why did you persecute Croats in the time of Yugoslavia?"" (the Kingdom of Yugoslava). - Pero replied to them "Listen people, that is not true, in that time I really was a good friend of Croats." - " No, you were persecuting Croats "- they said, and then brought him to the floor with rifle butts and smashed his head. The Ustasha then left the church and proceeded to drink in a nearby tavern." Ljuban Jednak walked away from the mass, together with five more men, with an idea to hide behind the altar. However, they returned into the mass thinking that they would be easily found near the altar. - " When the group of Ustashas came into the church they were led by their officer. He said to the Ustashas that if any one of us escaped from there, then nobody of us would survive. The Ustasha ordered us to take our clothes off. Having taken off upper garments, we were left in the laundry. Then we were ordered to lay down, after which they began slaughtering with knives. " During this cruel slaughter Ustashas somehow skipped Ljuban Jednak and he wasn't touched with the knife. 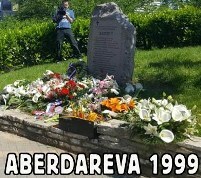 Thinking that all Serbs were slaughtered, the Ustashas left the church and went to drink. Ljuban then laid down between dead people and smeared himself with blood. After some time, the Ustashas returned and started bringing the dead out of the church and throwed them into trucks, as they were logs. Ljuban ended in a truck on the top of the pile of corpses. But it seemed to them that there were too many corpses in this truck, so they threw him onto the street and then brought him into the other truck. - " I'm looking at two Ustasha sitting on the pile of dead people. One sit in one corner of the truck and other in another corner of the truck. I see we're going to Petrinja, and then turning to the left, to the place called Prekope, where they threw us into previously dug pits. When they threw us out of the truck, a heavy man was thrown on me, and another was still moving. The one Ustasha saw this man and said: "Look, there is one still alive." He took his rifle and fired. This bullet wounded me in the left calf. The wound was not deep. I felt as if someone had put a lighted match on the calf. " 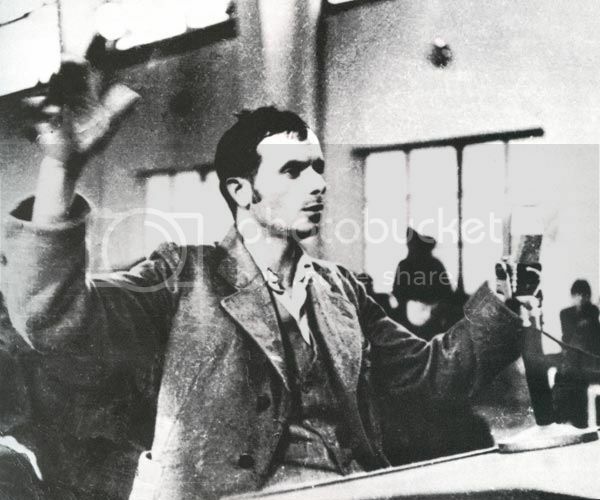 Ljuban Jednak testifies at the Court about the Ustasha massacre in Glina in 1941, after the WWII. One Ustasha noted that Ljuban was wearing a wool sweater, so he took it off him while he was pretending to be dead. They threw him back into the pit. Later, one man moved in the pit. Ljuban asked him, "Dude, are you alive?" "Yes," - he said. "And who are you?" Ljuban asked again. "I'm Dusan Zlokas from Shatornja. What should we do now? "Ljuban told him to run away and got out of the pit and hid in a hedge. How Zlokas was not coming, Ljuban went to the place Majske Poljane where his uncle Paul Loncara aka Pajo lived. While he was on the way, he met Stojan Rebraca who helped him. Ljuban remained hidden for several days at his uncle's house. After healing, he was transferred to the unit of Yugoslav partisans, and later became the bearer of the Commemorative Medal of the Partisans 1941. The other man that survived slaughter, with the surname Zlokas, managed to get out of the pit and come back home. Someone, however, betrayed him and the Ustasha caught him again and killed him. - "... Such atrocities in the Glina church, committed by drunk with the blood fascist vultures - Pavelic's Ustasha, history doesn't remember ever to happen. In the district of Glina approximately 2,600 people were killed and in the district of Vojnić 960 people. In the district Vrginmost 200 people were killed, in Velika Kladusa 2,700 people, and by the mid of August, 1941 this number rised up to 6.460 of men, women and children." Serbian Orthodox Church of the Holy Virgin was built in Glina in 1846. Shortly after the massacre in 1941, the church was completely destroyed by the Croatian Ustasha. After the Second World War, the remains of the victims were transferred to the Serbian Orthodox cemetery in Glina in 1947. On June 27, 1951, tenth anniversary of the massacre, the Yugoslav Communist authorities raised a common ossuary memorial for all the victims at the site of the demolished church. On July 4, 1969 the people of Bania raised the Memorial House of victims of fascism in Glina with their own contributions. After the operation of ethnic cleansing named "Storm" in 1995, Croatian authorities renamed the former Serbian Orthodox Church site in Glina, and then the Memorial House of victims of fascism in Glina, into the Croatian National Home. During the criminal operation "Storm", Ljuban Jednak found himself again with his persecuted people in the columns on their way to Serbia. He died in 1997 in Pancevo, Serbia. Do not forget and do not repeat!